Love that light - and the gentle frost. I didn't know that you also have there sometimes a little frost. This photo is so beautiful, the perspective, the light and and of course the cows are lovely. Too close for comfort... but it was worth it. I love this! Great perspective and light. A great photo indeed. I had forgotten about how cows are curious about things and like to come for a look and see. I'm always amused by cattle's inquisitiveness! The light and the frost just added to the photo. A great photo of the curious cattle. Linda (above) beat me to it.... Whacha doin? They want someone to come play the trombone at them. Cute shot. Love your blog! Nice photos. You get the best light in most of your pictures. I love the golden glow in the background. Eine tolle Perspektive für das Bild,Sehr schön. 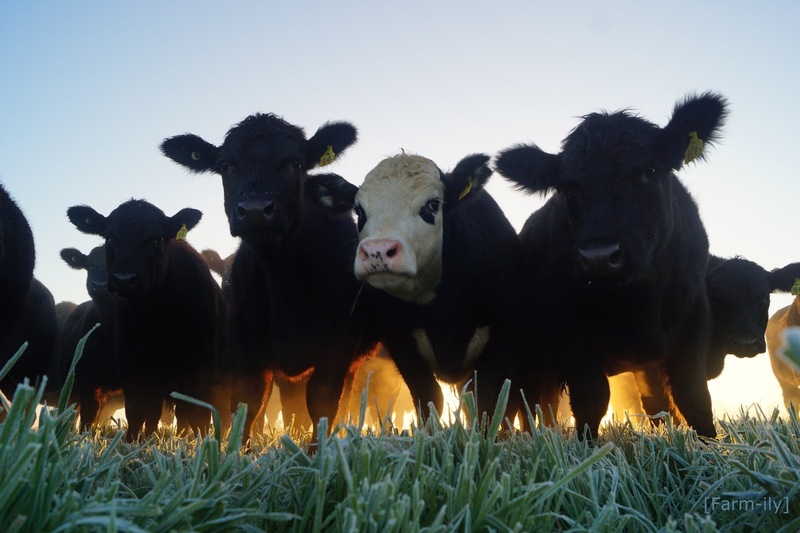 Love the perspective of this shot - looking up into the cattle's faces.